Chopping down a tree with an axe is always a nice workout and satisfying thing to do. Having the right felling axe for the job makes it a lot easier to get trees down. But which axe should you buy? Should you go for a 28-inch handle or a longer 36 inches one? And what is your budget? You can get a premium axe for around the $200 that will last for life, you do have to chop down only a couple of trees? This article will help you out selecting the best felling axe and give you some tips howto diced which axe is the best for felling trees. 1 What is a Tree Felling Axe used for? 2.1 What is the difference between a felling AXE and a splitting AXE? What is a Tree Felling Axe used for? A felling axe or forest axe is used for cutting down trees and remove branches. They are designed to chop across the wood grain and not to split the wood. A felling axe has a tempered head and a really sharp and thin edge. This way they are able to cut the wood grain as deeply as possible. First, let start with some tips on selecting the best axe. What is the difference between a felling AXE and a splitting AXE? The biggest difference between a felling axe and splitting axe is the shape of the head. A good felling axe has a long rounded edge with a tapered head. They are designed to cut across the wood grain as deep as possible. A splitting Axe, on the other hand, is designed to go along the grain of the wood fibres. You will also find a difference in the head weight, the weight of the head of a felling axe is between the 2 and 4 lb. A splitting axe, on the other hand, has a heavier head to give you more force when splitting the wood apart. The edge of the head is very sharp to cut the wood fibres. The length of the handle of a felling axe is between the 28 and 36-inch. Most people are tent to pick a long handle. It will give you a more powerful swing, but the downside of a long handle is that you will lose control. You will have to pick an axe that fits your strength and length. This way you will gain more accuracy which will result in a more efficient wood cutting. The length of a handle is measured from the top of the head to the bottom of the handle (end knob). Now to pick the right handle length, you can use the following trick: You should be able to swing the axe between your legs without hitting the ground or you. For a 6 feet tall male, a 28-inch handle is most of the time the best fit. This will give you the most control on the axe. If you are inexperienced or not a really strong person, then go for a lighter head. A heavier head will give our more force, but you will lose control over it. Also, it will make you tired faster. Go for a head weight around the 2-pounds. On the other hand, if you are an experienced woodworker and/or pretty strong when you can use that extra head weight to your advantage. The extra head weight will help you get that tree down faster, resulting in fewer swings. Many people favour a wooden handle. They are durable and easy to replace. Always make sure you check the grain of the handle, it should run parallel to the axe bit. The more growth-rings the better, it will make the wood stronger so it doesn’t break when you overstrike. Some handles are varnished, while this might look nice and give you a feeling that the wood is protected it has one downside. It makes the handle slippery, something you don’t want because the axe can fly out of your hand. So sand it off if some sandpaper for a better grip on your felling axe. Some axe handles are made from fibreglass. They are almost unbreakable and are a great alternative to the wooden handles. A really affordable and good quality felling axe. 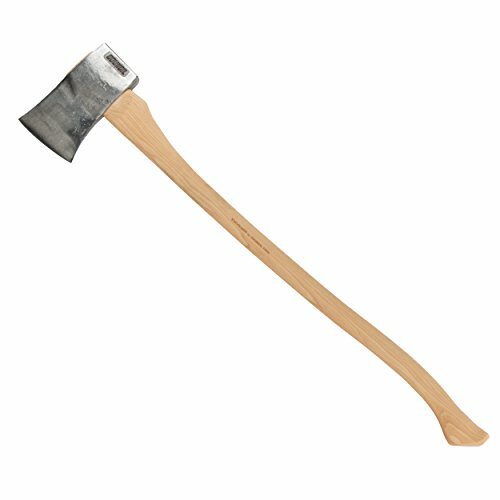 You can get this axe for around the $50 / $60, making this axe one of the cheapest in this best felling axe comparison. 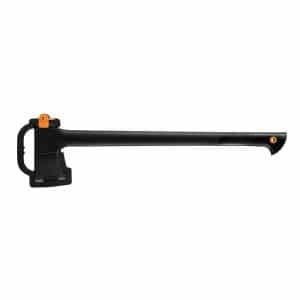 Husqvarna is known for its good Swedish steel quality and nicely made handles. The grain on the handle is very good and has a great feel. The head and handle are in perfect balance which is important when your swing the axe. The head of the Husqvarna is a little thicker than the others, adding a little more weight into it. Overall a great axe for the price, a little heavy but then again, you can use it for splitting wood also. This Fiskars Chopping Axe is, just like the Husqvarna, a popular felling axe. Both are reasonably priced and made from great quality. The handle is made from fibreglass, so there’s is no metal to rust or wood to split and it’s stronger than steel. With a head made of drop forged Swedish axe steel and a lifetime warranty, you are set for life with his axe. The Velvicut is a full-sized American felling axe. This is a working man’s axe. You can fell hundreds of trees with this and pass it along to your grandson. Yes, it might be expensive, but you get a premium quality felling axe that will stay in your family for generations. 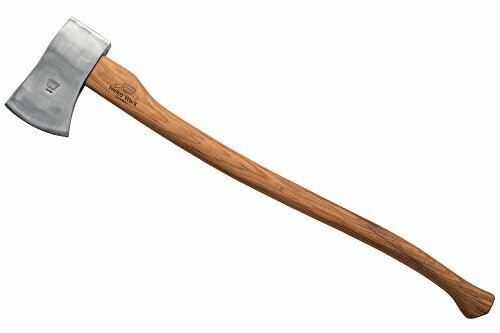 The head of this American Felling Axe is made from 5160 American forged steel, ensuring a though, strong and durable head that will hold his edge not matter what type of wood you swing this beast into. With a beautiful created long handle (32″), and well-balanced, razor-sharp head you are ready to take down any tree. Check out other American made felling axes if you are looking for a tree cutting axe that is made in the USA. With a total weight of 6.5 lb and a total length of 35 inches is this the biggest and heaviest felling axe in the list. Does this make the best felling axe? It depends if you are up for it. Helko Werk axes are handmade in Germany. Just like the Velvicut, this is a full-sized premium felling axe that will last for generations. This axe is big and heavy, so you really need to have the proper length and strength to give his axe a nice swing. The Hults Bruk felling axe comes in two models, the Kisa and the Torneo. The latter is $50 cheaper. Both are made from same steel, hickory and leather. The difference is the time spent on finishing. Kisa is the premium version of the basic Torneo. You will find the differences in the time spend on forging the head, sharpening the edge, finishing the handle and little details like the sheat (Full or halve covered) and logos. Overall is this a nice mid-sized felling axe with a good quality. If you go for the Kisa model, you will get shaving sharp edge and a great finish. This axe will last a lifetime when taken care properly. You know now everything there is need to know about a felling axe, how you pick the right tree cutting axe for you to make chopping down the trees a lot easier. Pick the right felling axe based on your budget, length and strength to gain the maximum control and power.